June 11, 2018, Bangalore: BGS Gleneagles Global Hospitals, a Parkway Pantai Enterprise is proud to launch an emergency helpline number that primarily aims to guide a person in times of medical emergencies. The emergency number, 91086 86400 was officially launched over the past weekend. 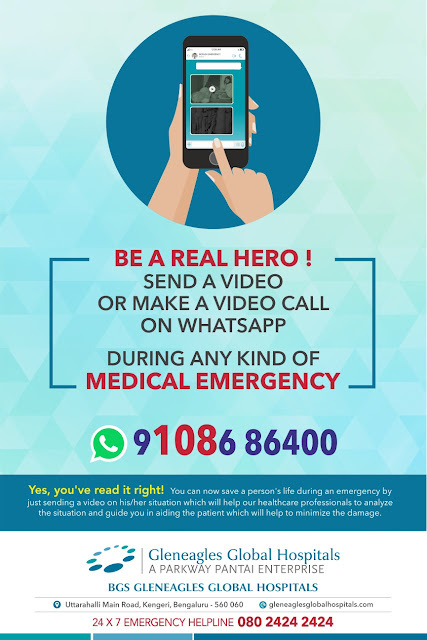 The special feature of this emergency number is that anyone can use it to send a video of the person in distress or even opt for a video call on whatsapp to chat with a medical professional from BGS Gleneagles Global Hospitals. This is especially useful while one may be waiting for an ambulance to arrive and the condition of the patient may be critical, therefore warranting immediate action to possibly stabilize the patient’s condition.